My website has received awards and certifications. 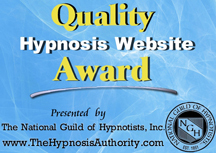 The National Guild of Hypnotists certifies that it meets requirements for an ethical and accurate website. The World Hypnotism Day Authority certifies my support of this annual event. CompliAssure Secured certifies that my practice meets all governmental standards for the use of credit cards.